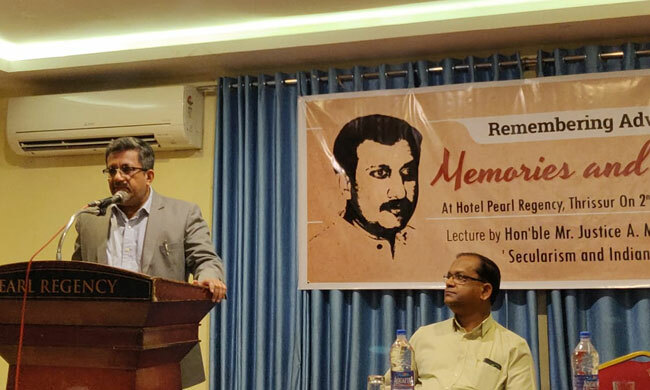 Kerala High Court judge, Justice A. Muhamed Mustaque on Saturday delivered a lecture on 'Secularism and Indian Constitution', as a part of the yearly lecture conducted in the memory of Advocate Jijo Paul. Justice Mustaque began with a brief history of the evolution of constitutional law and an insight into the beginning of a few European constitutions. He went on to explain how the constitution serves as a contract which we, as Indians, have entered into and given to ourselves. He added that therefore, each one of us are bound by our contractual obligation in preserving and honouring our commitment to ourselves in keeping the sanctity of the Constitution of India. Justice Mustaque also spoke about the 42nd amendment to the Constitution of India, when the words 'socialist secular' were added to the Preamble to the Constitution. He ended his address with the faith that religions will keep the spirit of secularism alive—when the Hindus practice Dharma, the Christians follow the principle of love and the Muslims bring in compassion. The lecture was organised in remembrance of Advocate Paul, who passed away in December, 2011. He is survived by his wife, Sonia Jijo and two kids, Miriam Jijo and Lucy Jijo. Advocate Paul studied law from Government Law College, Calicut in 1989, and enrolled as a lawyer in 1995. He began his practice at Thrissur District Court as a junior to Late Adv. K Devadas. He then moved to Kerala High Court under Late Senior Advocate Retna Singh. He also worked with Late Senior Advocate BS Krishnan, before starting an independent practice. Post his demise, the NGO 'JanaNeethi' has been conducting lectures every year in his memory. The organisation of the lectures was taken over by Jijo's friends last year.